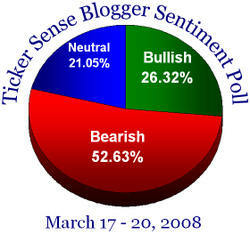 This week's poll remains modestly bullish. 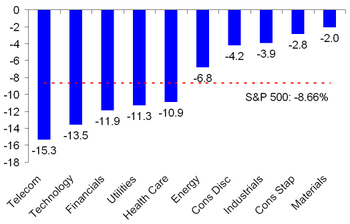 As of yesterday's close the S&P 500 was down -8.66% for the year. The telecom sector has been the worst performer, down -15.32%, and materials have performed the best but are down -2.04%. For the S&P 500 members, 379 stocks are down and 122 are up. Of the stocks posting gains, WMT, IBM, DVN, and EOG have helped the market the most; while MSFT, GOOG, AAPL, XOM, and C have lead the decline. There are 64 active industry groups in the S&P 500 right now; 13 have posted gains, and one of them is up over 10%. For more detailed sector, industry, and stock analysis try Birinyi Associates' Mini-Institutional service. The report is completed at 8am every day and available shortly thereafter. Everything you need to know is available on a single page. 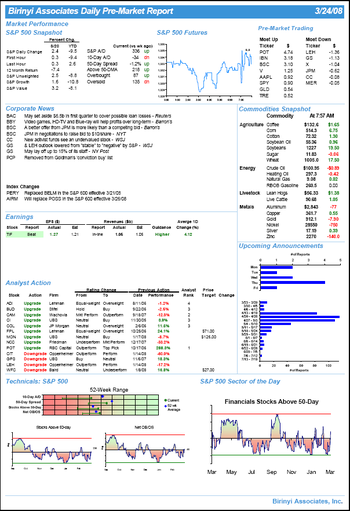 The Daily Market Report is available only to Mini-Institutional subscribers, click here to receive yours today! Birinyi Newsletter, Get Your Copy Today! 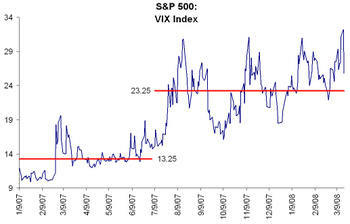 Laszlo Birinyi's monthly market commentary (available only to subscribers). Market about stocks not industries. 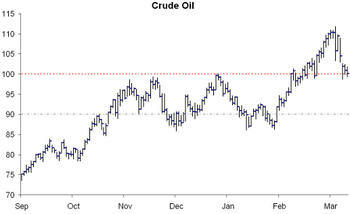 A deeper look at crude. Extreme sentiment and extreme changes. 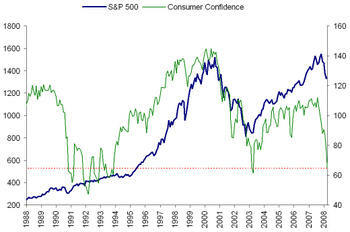 Economic sentiment, who is right? 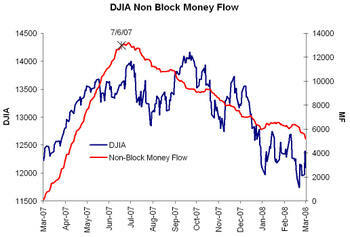 In addition, each newsletter contains Birinyi's detailed flow of funds analysis and the S&P 500 sector analytical insert. For more information and subscription details click here! Crude's recent decline has brought prices down to $100/barrel again, a price which also seems to have sentimental value to many commodity traders. Oil neared $100 in November, December and January before speculation (and we expect short covering) pushed the commodity above $110. The last three trading days have seen crude drop below $100, but so far is has held. If the decline continues the next significant price is $90, although the lower end of the November - February range is $87.50. The poll has been almost as volatile as the market over the last few weeks, but the bulls have returned with a positive outlook on the week. Posts have been light recently because the insight we can offer comes as more in-depth research that does not lend itself to a blog post. 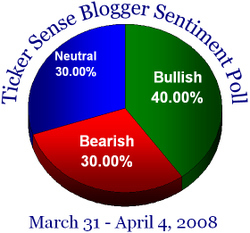 Short-term market analysis seems to be almost useless, since any conclusions are squashed by whatever news the market decides to pounce on that day. 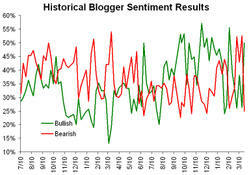 The chart below shows that little attention has recently been paid to stock picking, but more that traders jump on the back of the market and drive all stocks down together. Birinyi Associates measures market breadth as the number of advancing names minus the number of declining names. 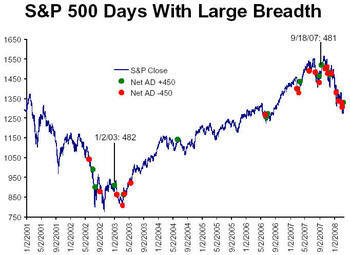 The typical universe is the S&P 500, where extreme market breadth has been defined as a one day reading of + or - 450. 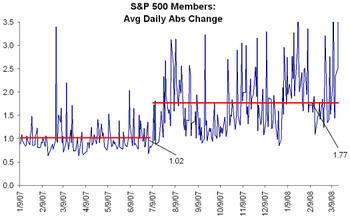 As shown, the current period has had the most extreme days since 2002. 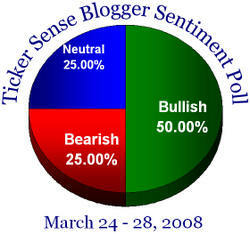 This week's poll is decidedly bearish.